Neil Gaiman's Journal: YOUR LONG, PAINFUL WAIT IS OVER! A Cover is Revealed! YOUR LONG, PAINFUL WAIT IS OVER! A Cover is Revealed! This is the cover of the UK edition of Fortunately, The Milk, illustrated by the amazing Chris Riddell. And when I say illustrated, I mean there is a glorious Chris Riddell drawing on pretty much every page. 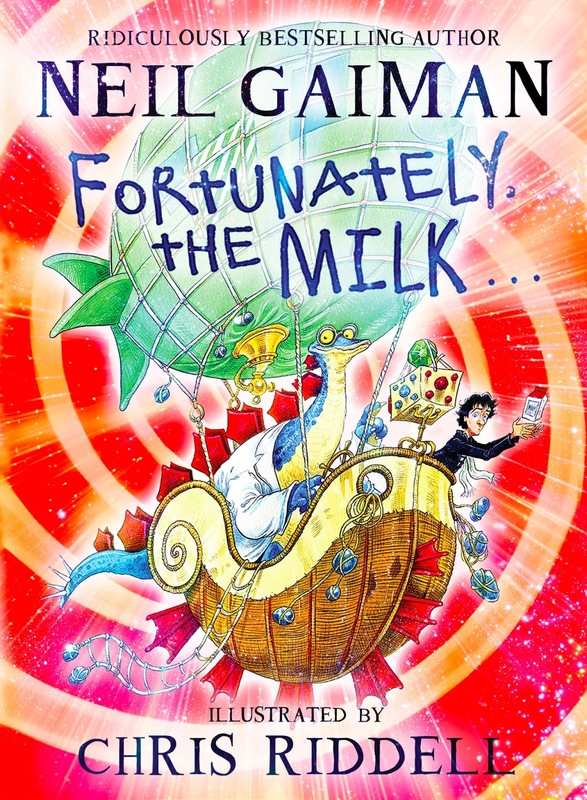 This is quite possibly the most exciting adventure ever to be written about milk since Tolstoy's epic novel War and Milk. It has aliens, pirates, dinosaurs and wumpires in it (but not the handsome, misunderstood kind), also a never-adequately-explained-bowl-of-piranhas, not to mention a Volcano God. It will now be released on the same day as the US edition, September the 17th. I'LL BE ON THE ROAD A LOT THIS SUMMER AND AUTUMN. The Portland signing has already sold out. The London Royal Society of Literature event has sort of sold out -- they're not selling any more tickets but are keeping a large handful to go out on the day.